COLUMBUS, Ohio – A new study showed improvement in the social and communication skills of children with autism spectrum disorder (ASD) using a signature approach pairing the recitation of Shakespeare’s rhythmic language with physical gesture. Children with ASD often have trouble understanding non-verbal behavior in social interactions and struggle to communicate. Many avoid eye contact and miss visual cues, making it difficult to maintain peer relationships and share enjoyment of mutual interests. Results, published recently in the journal Research and Practice in Intellectual and Developmental Disabilities, showed better language skills and recognition of facial expressions in children with ASD. “At the end of the study, which incorporated Shakespeare’s play The Tempest, children with autism showed significant improvement in their social skills and their ability to engage in social relationships,” said Marc J. Tassé, professor of psychology and psychiatry and director of the Nisonger Center at The Ohio State University Wexner Medical Center. Fourteen children with ASD were enrolled for the only systematic implementation of a drama-based social skills intervention known as the “Hunter Heartbeat Method,” created by Kelly Hunter, an actress in the Royal Shakespeare Company in London. The novel therapeutic approach was designed to improve social interaction, pragmatic language and facial-emotion recognition skills of individuals with ASD. “These children are taught these core skills in a very relaxed and playful environment, where it’s almost like they’re not aware they’re being taught,” said Tassé, also co-author of the study. Each session of the “Hunter Heartbeat Method” begins with the children quietly seated in a circle on the floor making a “Hello Heartbeat” by tapping their hand on their chest. This allows them time to adapt to the environment and signifies transition into the session. 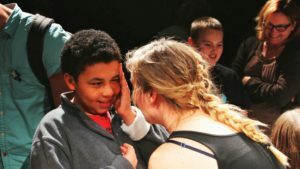 Facilitators then lead the children through a series of games based on the plot of The Tempest, which focus on skills such as facial-emotion recognition, eye contact, gross motor imitation, affective imitation, pragmatics of dialogue exchange, personal space, turn taking, affective expression, humor, and social improvisation. “You interact with someone, you enjoy yourself and you get that intrinsic reinforcement of socializing — children with autism don’t always get to experience that,” said Maggie Mehling, co-author and psychology graduate assistant at Ohio State. Pre-test assessments were conducted to obtain baseline information for each child. The children participated in the intervention one hour per week after school for 10 weeks. At the conclusion of the study period, post-test assessments were completed, and parents and participants completed questionnaires regarding their impression of the intervention. “It just blows me away every time I see how the kids are able to exceed all expectations with their ability to get engaged,” Mehling said. The research highlights the collaboration between the Nisonger Center, the Department of Theatre at Ohio State, the Department of Psychology at Ohio State, Columbus City Schools and the Ohio State University/Royal Shakespeare Company partnership. Robin Root of the Department of Theatre at The University of North Carolina at Wilmington also participated in this research. Click here for more information about ASD research, or go to: http://www.nisonger.osu.edu/shakespeare-autism.